The realtor and the young couple are discussing the nuances of lease or purchase sale of real estate on the background of a modern building. 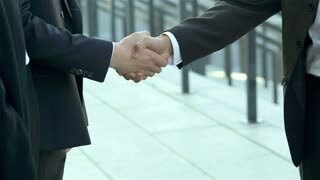 Friendly diverse business partners greeting each other with handshake in the cafe during informal meeting. Positive businessman warmly welcoming his lovely female colleague before negotiation.